"A decapitated head can continue to see for approximately twenty seconds. So when I have one that's gawking, I always hold it up, so that it can see its body. It's a little extra I throw in for no added charge. I must admit it makes me chuckle every time." MPAA Rating: R for language, violence, gore and horror. While the original Exorcist of 1973 is an undisputed horror classic, this 1990 sequel handily accomplishes the difficult task of living up to the original. 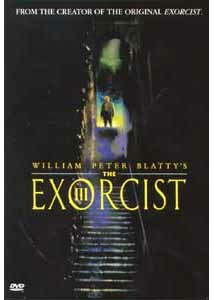 Exorcist III is based on William Peter Blatty's Legion, the follow-up to his original Exorcist novel. Simply adapting his book for the screen this time was not good enough for Blatty, who also takes the helm in his directorial debut. We can all pretend along with Blatty that the second movie, Exorcist II: The Heretic, never happened, because if it did there is no evidence of it here. In any event, that film is completely irrelevant to this one. George C. Scott takes the role of detective William Kinderman, who was effectively played by Lee J. Cobb in the original. Kinderman is challenged by a mysterious series of gruesome murders that follow the pattern of a killer, who just so happens to have been dead for fifteen years. His investigations lead him to a hospital where the murders continue, and the strange link to the exorcism that had occurred fifteen years before. Where Cobb played the character in a very low-key manner, Scott tends to be more emphatic and powerful. However, in this film he's under higher stress and clearly more tired of the difficulties of life, so the differences in portrayal are not inappropriate or too jarring. Playwright Jason Miller briefly reprises his role as Father Karras, one of the exorcists from the original film. Brad Dourif shines as the Gemini Killer, an embodiment of pure random evil and cruelty. Just when we think he's hamming it up too much, Dourif pulls back and laughs at himself and those around him. Between Blatty's fine writing and Dourif's performance, this role is a solid tour de force. Nicol Williamson, as the new exorcist, Father Morning, has little to do and his character is unfortunately underdeveloped, which is probably one of the more serious failings of the film. While there are incredibly gruesome events that occur in this film, wisely they nearly all take place off-camera, allowing us to use our imaginations in a way not really seen since the atmospheric Val Lewton horror classics of the 1940's. For instance, under the credits, we learn that a young black boy has had ingots driven into his eyes, been beheaded, his head replaced with that of a statue of Jesus Christ—in minstrel blackface, and crucified on a pair of rowing oars. In the climactic exorcism, things do get a little grisly, but by and large the horror is implied and not shown.Blatty's direction is sure-handed and effective. The camera moves when appropriate, and is absolutely still at other times, to tremendous effect. The shot in the hospital hallway (chapter 22), without music, and with a completely stationary camera, is one of the most chilling ever in cinema. The only thing that seems to be missing is an epilogue of some kind, since there are several serious loose ends (such as what happens at last to Kinderman) which are left untied. Just another 30 seconds would have been all that was needed to take care of these, leaving a slightly disturbed feel to the ending. Image Transfer Review: The transfer of this film is extremely dark; even with a direct view television you should view it only in a darkened room. However, once your eyes adjust, the picture is clear and sharp, with vivid (though dark) colors. Some of this darkness is no doubt intentional, to reflect the dark and hopeless world the characters inhabit. The effect seems overdone. On those occasions where appropriate, however, the whites and colors are dazzling. The special effects work is generally good, though a few segments (Julie's narrow escape from a bone cutter, and the flames during the exorcism) have a slightly unreal appearance to them. However, these images looked about the same in the original theatrical release, so this is the fault of the source material, not the transfer. Only a widescreen version of the film is presented. Upon viewing it seems obvious why a Pan & Scan version would not be practical: in a number of scenes, Scott and Dourif are at opposite sides of the screen, with largely empty space between them. A Pan & Scan version would have to make incredible lurches and cuts in order to follow the dialogue, or simply focus on the empty screen. These sequences would have made a great widescreen vs. Pan & Scan demo. Audio Transfer Review: The English 5.1 Dolby track is chilling, with heavy effect use of the subwoofer. When supernatural events occur, the subwoofer ominously comes to life with a dramatic rumble. The surrounds are not active often, and the directionality of dialogue is fairly limited. However, the sound design is in general solidly effective. Dialogue is generally natural sounding, though a little center-focused. The French 4.0 Dolby Surround track is nearly as good as the 5.1 version. The parties doing the dubbing do a passable imitation of Scott and Dourif. Extras Review: The only extra provided is a theatrical trailer (a prerelease version, when the film was titled The Exorcist III: Legion). The trailer has good color and is in fine condition, though it is only in Dolby Surround 2.0 sound. Disappointingly, not even subtitles are provided for the main feature. In all, this is a much more restrained film than the original, and this restraint is used to good effect. Exorcist III is easily one of the best horror films in recent memory. Warner's presentation leaves a good deal to be desired, but the film itself carries the day. Recommended.